I do like a good chorus, and I think I probably always have done. So this could be just the chorus I’m looking for. This is the first app for Fred Anton Corvest, and, from the look of it so far, I’m hoping that it won’t be the last. From the look of the design of the app it’s been very well thought through, which is always appreciate. 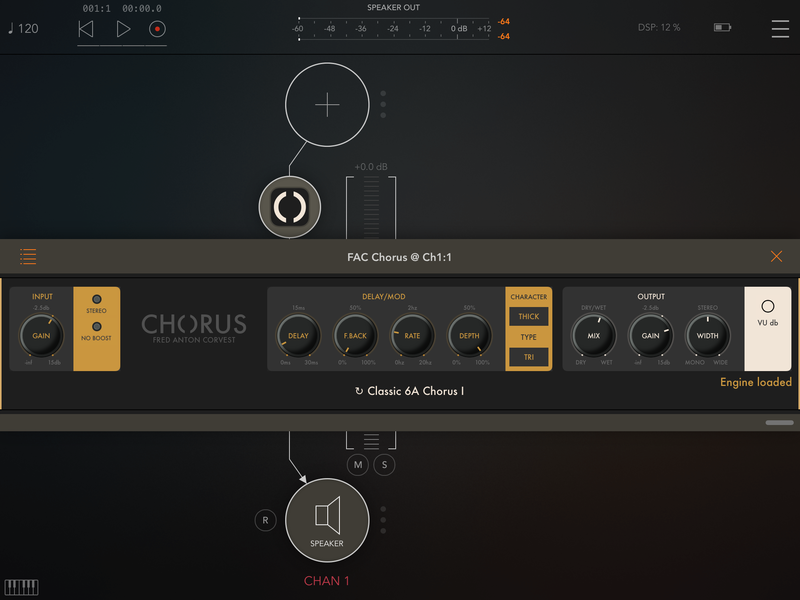 FAC Chorus, a versatile chorus effect emulation designed to simulate the characteristics of the classic chorus modules with the flexibility of customising the parameters of the main components involved in the signal path. The interface has a unique sober look and provides a great user experience. The knobs are very responsive, natural and follow a specific curve according to the parameters type. The efffect is built upon two individual delay line paths controlled by common parameters. The behaviour of each delay signal path is defined by the chorus type parameter. Thick type means warm characters and emulates the behaviour of the BBD. Clean type, as the name says, provides a cleaner sound with a larger modulation. From a first look I think that this could be a good addition to anyone’s AUv3 collection. I’m keen to try it out and get a deeper understanding of just how close and emulation this is.